Flasks make great promotional items and personalized gifts, and this flask covered in a durable, elegant leatherette material takes them up a notch. 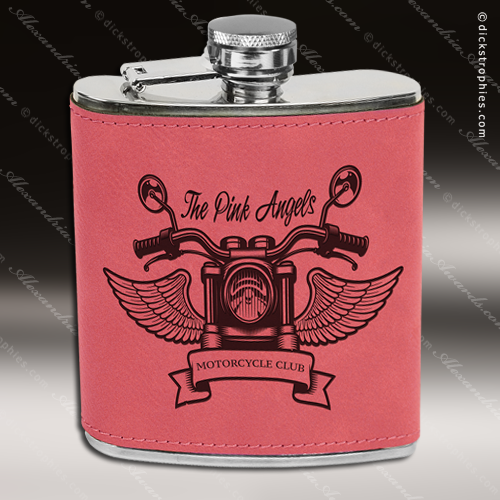 The bright pink personalizes to a stunning black contrast, and top stitching all around the top and bottom give it a finished look. 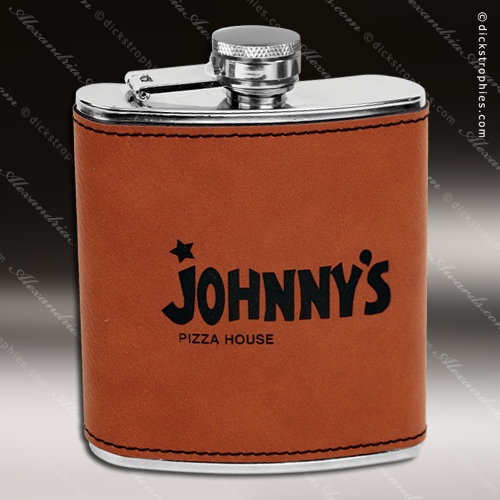 If you're looking for a unique way to promote an opening of your new bar or restaurant, a personalized gift for your groomsmen, or a gift to commemorate any special event or occasion, this might be just what you're looking for. 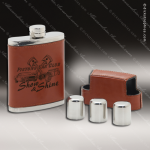 These stainless steel engravable flasks are perfect if you are looking for something different to give as gifts. 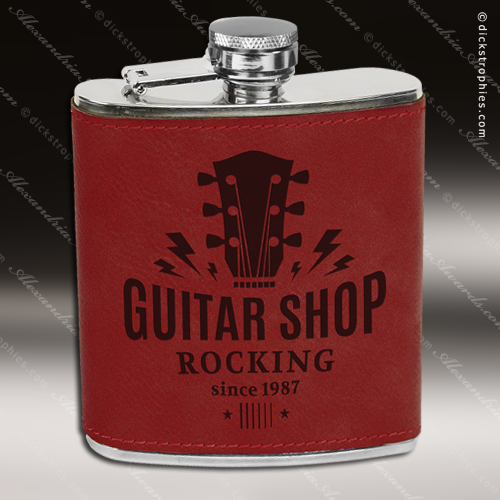 These flasks hold 6 oz. 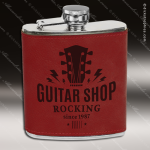 of liquid and the screw top lid is attached to the body of the flask. 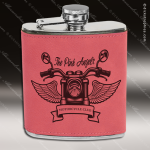 With your choice of four colors, stainless, black, pink, and tan leather ensures that you will find the right color for everyone. 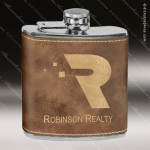 These flasks can be engraved with your logo or anything else you may want to put on them. Flasks make great promotional items and personalized gifts, and this flask covered in a durable, elegant leatherette material takes them up a notch. The rose' leatherette personalizes to a stunning black contrast, and top stitching all around the top and bottom give it a finished look. 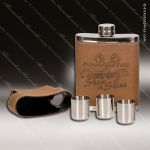 If you're looking for a unique way to promote an opening of your new bar or restaurant, a personalized gift for your groomsmen, or a gift to commemorate any special event or occasion, this might be just what you're looking for. 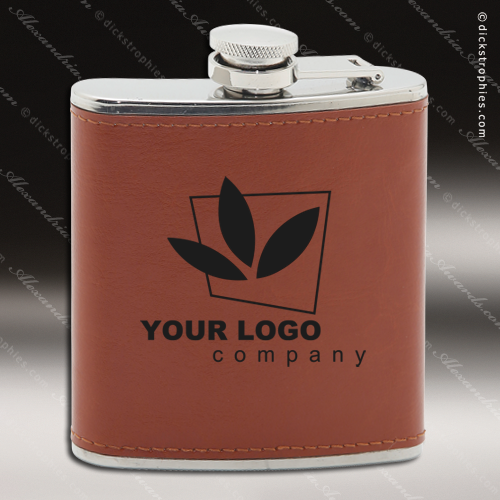 Flasks make great promotional items and personalized gifts, and this flask covered in a durable, elegant leatherette material takes them up a notch. The Rustic personalizes to a stunning gold contrast, and top stitching all around the top and bottom give it a finished look. 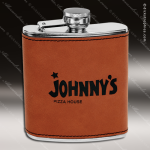 If you're looking for a unique way to promote an opening of your new bar or restaurant, a personalized gift for your groomsmen, or a gift to commemorate any special event or occasion, this might be just what you're looking for. 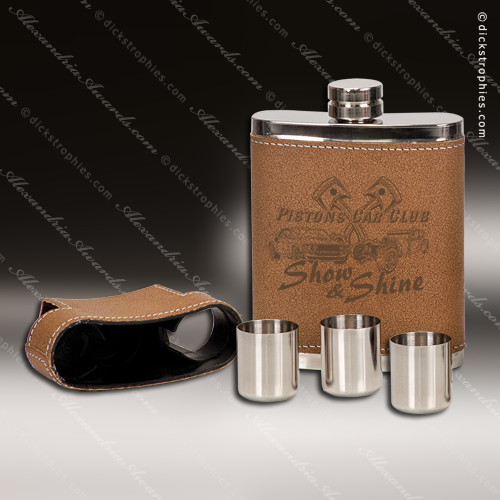 This handy 7oz flask is wrapped in rich looking "leather", and comes with 3 shot glasses that fit into the lid for easy carrying and storage. 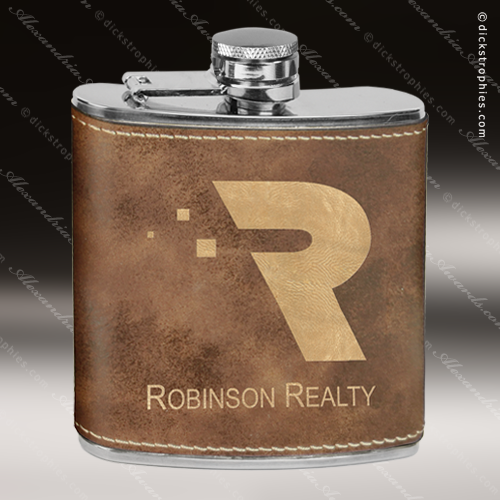 The flask can be personalized, making a very attractive and useful gift, incentive or promotional item.